Russ Andrews winter sale starts today | What Hi-Fi? There are reductions of up to 40 per cent in the Russ Andrews Winter Sale, which starts today (23 December), on a host of accessories including speaker cables, interconnects, mains blocks and conditioners. Leading the deals is the Crystal-24 speaker cable, which uses Kimber Kable’s woven cable geometry and Hyper-pure copper in its 24-strand construction. Early birds to the sale can grab the remaining stocks of this cable with a 40 per cent discount. A 2.5m pair, fitted with Kimber banana plugs or spades as standard, is reduced from £694 to £416. Upgrades can also be added including WBT plugs, changing the configuration to bi-wire cable, or adding DCT cryo treatment. • 10 per cent off the new PowerKord-300 with a free upgrade to silver Wattgate W350i Ag IEC plugs. • 10 per cent off its PowerMax Plus cable, bringing a 1m cable down to £47. • 10 per cent off the PowerBar mains extension, also available with a half price PowerMax cable. • 10 per cent off mains conditioners and up to 25 per cent off the Clarity Mains System Enhancers. 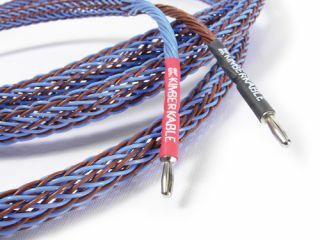 • Analogue and digital interconnects and the entire range of speaker cables all come with an additional 10 per cent discount. * The classic Kimber Timbre interconnect, fitted with the noise reducing MiniZaps, has been reduced by 25 per cent to £169 for a 1m pair. • TheTorlyte Platform is available with a free additional set of three Jumbo Cone Feet and a price reduction of 20 per cent. • And, with all orders over the value of £50, customers will be able to claim a half price pack of ReVeel and ReleeS, the company’s CD cleaner and anti-static solution, normally retailing at £30. The Russ Andrews Winter Sale starts on December 23rd and ends at midnight on February 5th 2014. View all the deals at www.russandrews.com.